A joint creation between Mont blanc and Van Cleef & Arpels, this is the most expensive writing pen ever created. It costs $730,000! Each pen has 840 diamonds and more than 20 carats of gemstones set in a Van Cleef & Arpels patented 'Mystery Setting' that conceals the stone settings. 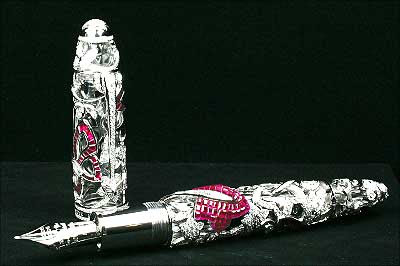 There are three variations of the pen, set either with rubies, sapphires or emeralds, and accented by diamonds. Artisans took over 18 months to create this pen.